Norfolk House is a traditional Blue Mountains retreat which we think combines the ambience of simpler days with the modern conveniences we have become used to. 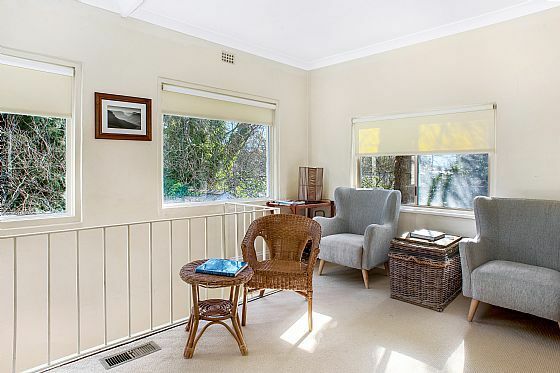 Located just minutes walk from the village and railway station in Wentworth Falls; it is conveniently situated for all Blue Mountains attractions. Built in 1906 as a one bedroom workers cottage then progressively added to by various owners, the house has recently been restored and is now offered as holiday accommodation for between 2 and 10 guests (plus 2 babies). It is available for weekends or longer periods. Its unusual two-level layout means that it is cosy for a couple but has enough space to hold two families or a group of friends. In renovating during 2008, we made a conscious decision to preserve the much of the character of the house and choose furniture and fittings which captured the simplicity of the original cottage. So no spa baths, designer furniture, heated towel racks or pay TV ... but we love to stay here and think you will too! The house sleeps up to 10, with an additional 2 cots provided. a large sunroom with double sofa-bed*, bean bags, books/games/music and a dining table which seats eight (one high chair provided). * Note that there are no curtains in the sun room so mornings in summer will be bright for those sleeping here. There is a stair gate at the top of the internal stairs; please note that the grounds are not fully secured so young children will require supervision. Under-floor gas heating operates on both levels. The house is not air conditioned but several fans are provided. The house is equipped with limited supplies of essentials such as soap, dishwashing liquid, toilet paper, washing machine powder, olive oil, condiments and “arrival” tea/coffee. In addition a selection of books, games, CDs, DVDs and videos is provided. Bedding, including sheets, duvets and throws are provided for all beds. The exceptions are the cots where only fitted sheets are provided so please bring any other requirements. Towels are also provided. There is an outside table and chairs suitable for al-fresco dining. The garden itself is fairly large and balls plus some outdoor games are also kept at the house.